Am I the only person scatter-brained enough to need to write things on her hand? The ring you see there is an upgrade. The one I mentioned in #6 here ended up causing my skin to go crazy, so no more $12 rings for me! I got this one for $20 at a gift shop. Much better. The blue bracelet in the photo is from 40 Days for Life. If you’re in Austin, there’s going to be a great kickoff event on February 17th, with Abby Johnson as the speaker (here’s a flyer with all the details). I’m definitely going to try to make it. Should be a great event. I didn’t intend to spend so much time talking about a picture of my hand. 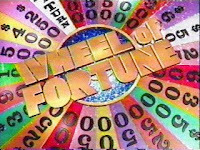 Yaya wants to go on Wheel of Fortune. If the phrase-guessing skills she employs while yelling at our television are any indicator, she would be an excellent guest. She actually contacted them but never heard back. They have NO IDEA what kind of ratings opportunity they’re missing. I can’t tell you exactly what would happen if she were a contestant; I only know that it would end up all over Youtube and be in “Funniest Game Show Moments” collections forever. Guaranteed. That’s better than the time last year when a friend found me hunched over the grounds outside the school, picking in the dirt. When she asked me what I was doing I explained that I forgot that it was show-and-tell day. Each child was supposed to bring items of a certain color; luckily my son’s color was brown. I asked her if she happened to have a ziplock bag I could use (which she did, in her immaculate, organized minivan), and I threw in the sticks and dead leaves I’d collected to present to my son’s teacher as his show-and-tell items. I recently downloaded Matt Maher‘s song based on the Litany of the Saints on iTunes (called Litany), and I think I’ve already listened to it 100 times. I love litanies anyway, and Maher’s song is so sweet and soothing. Love it. 19. Sherry at Chocolate for Your Brain! « "I sought but I didn’t find. Now what?" I once brought our cat to school for our son's show and tell. (Son is now 29 years old.) I told the class the cat had an unusual name. (It's name was Sugar Brains.) My son told the class that the cat's name was Tiger. The teacher looked at me as if I was crazy. Thanks for bringing that memory to my mind. 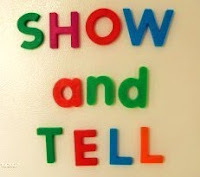 I love your show and tell tales. And, I write on my hands, too. Silly me.;. Thanks for hosting this. It's fun. I am a new joiner this week. Have a blessed day! Oh my goodness, I think we should go picket the WOF headquarters, lining up with signs that say, "WE WANT YA YA ON THE WHEEL, WE WANT YA YA ON THE WHEEL!!!" You crack me up! I'm not nearly so humorous…or succinct…today in my list. Yours is nice to read. I still write things on my hand, too, but it feels so middle-school that I usually just write the first letter of whatever I want to remember. Then inevitably I can't remember what the letter stands for. I have a notebook jammed full (that has to get replaced eveery couple months) that has all my notes to remind myself. My hand wouldn't be big enough. I have found it to be more fun to post waaaay early in the morning than waaay late at night. Don't know why. It just is. I LOVE Matt Maher! He is an incredible song writer and gifted artist. My favorite song on his new CD is "The Garden". Absolutely beautiful. My daughter writes on her hand. or arm. Frequently. It works – she doesn't see it – but I do. "money for trip" – meant that I saw it and sent in the next installment for the big school trip. I have a friend who is trying to get on Jeopardy. Those shows have been on forever! Love it! I am so glad I'm not the only one who can't seem to get show-and-tell days right. One time I told my son to talk about his shoe. I wish I had thought of digging around in the dirt. I love Matt Maher! You should check out his song about the Mass, called "Communion"; it's such a beautiful song! I also have been writing things on my hand since middle school. I have a planner; I write in my planner…but then if the planner isn't open, I forget what I wrote. D'oh! I love Matt Maher. He came to our church last year and led the music for our service. I loved it. My husband, who is a very prim and proper man, didn't like it as much. He would prefer chanting by monks at all services! Actually, those are not all that bad show-and-tell items. I once lugged my infant brother off for home (scaring the wits out of my mother until the school called) for a fourth grade show-and-tell. And then there was the time that my hormone-rich teenage retarded son still in elementary school managed to wend his way through the computer world (we have no idea how since he was incapable of reading), find and download some very pornographic pictures that he proudly took into his elementary school class for show-and-tell, generating a call to me from the scandalized superintendent of schools whose wife was the teacher! Dirt and umbrella? Not nearly as embarrassing! Still chuckling over you digging in the dirt, Jennifer. 🙂 Also, wondering if you have a wedding ring or just enjoy buying cheap rings? I'll be the answer is in the post you linked to, which I have yet to read. In that case, never mind. See you on my blog soon! Until then, have a great weekend. I went to an open casting call for Wheel of Fortune. They have a traveling "Pat" and traveling "Vanna" and set up a mock set at the mall. It was nuts, so many people showed up to try out! They gave us all a raffle ticket and pulled names out of a bowl until they found enough contestants – I didn't even make it up to the stage. P.S. My friend's brother was on Wheel of Fortune last year. Her sister, who has Down's Syndrome, is a huge fan of the show. They didn't tell her her brother was going to be on the day it was aired, and you should have seen her face light up when he came screaming down the aisle. They got a picture and THAT was worth the whole trouble it took to get there. I hope Yaya reaches her goal! No quick takes for me this week, but love the reflection on your hand….funny. Hope you are doing well! I still write things on my hand! I also forget show-and-tell. My poor kid makes up LIES to "tell" when I forget. She will say "It's ok, we can share, like a story or something." When I ask what she shared it is always something over-the-top like "This weekend we are all going to go ice skating on my uncles pool!". I have never written notes to myself on my hand and I think I might be the only one! I do write a lot of lists though. I LOVED the show and tell stories, hilarious! Just curious – can you not have your wedding ring sized? I'm not sure how I would feel I couldn't wear my actual wedding ring. I always write on my hands to remember things. Because I will forget where i put my notes. It's only gonna get worse I fear! I've gotten to the point where I remember to always have a pen with me… I'm just not quite there yet with having paper on hand, lol. When I was a tyke, I brought a Transformer toy in for Show and Tell. (By "Transformer" I do not mean the actual brand, but rather a knock-off brand.) It turned out one of the other kids in the class was for some reason terrified of transformers, and I thought it would be funny to make it "attack" him. It was hilarious at the time, but in retrospect I think it wasn't such a good idea. Don't worry; I sometimes write on my hands, but only if I have a nice pen to do it with. Thank you for the link to Matt Maher….WOW! I write stuff on my hand too. My real wedding band cost $20. Hee hee. I like it, even though during the winter months I have to switch it to a fatter finger. Resizing it would cost $80 which seems kind of silly for a few months out of the year. Maybe I will grow out of my cheapskateness one year. But probably not. 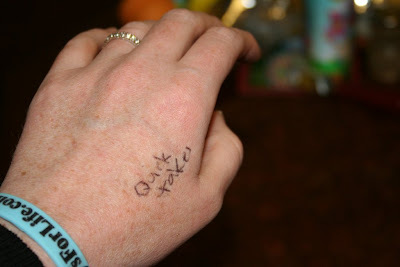 I used to write on my hand to remind me of things I needed to know from class to class (I am a substitute teacher), but then–duh–I would use the bathroom and wash my hands or give out the hand sanitizer and use some myself, and all my information would disappear. So I started writing on my forearm. Since I don't want to succumb to pen poisoning (would prefer to be driven slowly insane by school children-har)I guess I will have to come up with a different system. Perhaps I should find a small dry erase board and hang it around my neck with some string…. fun meme! This is my first time joining up with 7 quick takes. I just love your blog, both for your writing and for the community you have created. And I love squeaking in at 11:59 so that my blog timestamp still says "Friday" for purposes of this meme! I also was seriously – SERIOUSLY – going to take a photo of my hand today, too. Must be something in the air. Jen, I have been known to write on my hand from time to time as well. And speaking of scatterbrained, the last few days I'm having trouble remembering to change the baby's diaper at regular intervals! I can SO relate to the show and tell thing. I always feel like I'm a few steps behind all the other moms in my kids' classes. 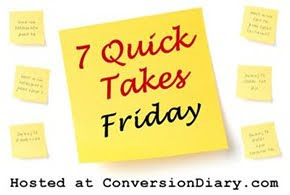 And speaking of that, I just now linked up my 7 quick takes. I finished them last night, after fighting with my computer for a few hours and then forgot to link. Ooops. I just wanted to tell you how much I love your blog. I love your spiritual insight, and I love that you dig in the dirt for show and tell items. I have five kids ages 5-20… my mind isn't as nimble as it was when the oldest was a preschooler. We've actually only remembered about show and tell approximately three times the entire school year. You've no doubt noticed the big hullabaloo that the left is making over Sarah Palin writing a couple of words on her hand for the Tea Party speech.